Doroudian Rad, M., Fatemi, S., Salmasi, M., Cyrus, M. (2010). Statistical Modeling of Adsorption and Selectivity of the Binary Gases of CO2 /CH4 , CH4 /H2 and CO2 /H2 on MWCNT-OH. International Journal of Nanoscience and Nanotechnology, 6(1), 53-64. M. Doroudian Rad; Sh. Fatemi; M. Salmasi; M. Cyrus. "Statistical Modeling of Adsorption and Selectivity of the Binary Gases of CO2 /CH4 , CH4 /H2 and CO2 /H2 on MWCNT-OH". 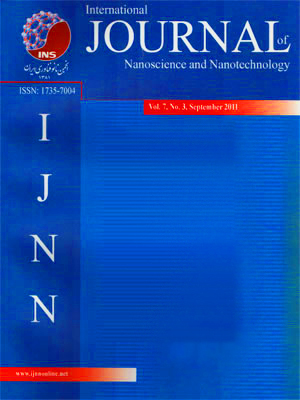 International Journal of Nanoscience and Nanotechnology, 6, 1, 2010, 53-64. Doroudian Rad, M., Fatemi, S., Salmasi, M., Cyrus, M. (2010). 'Statistical Modeling of Adsorption and Selectivity of the Binary Gases of CO2 /CH4 , CH4 /H2 and CO2 /H2 on MWCNT-OH', International Journal of Nanoscience and Nanotechnology, 6(1), pp. 53-64. Doroudian Rad, M., Fatemi, S., Salmasi, M., Cyrus, M. Statistical Modeling of Adsorption and Selectivity of the Binary Gases of CO2 /CH4 , CH4 /H2 and CO2 /H2 on MWCNT-OH. International Journal of Nanoscience and Nanotechnology, 2010; 6(1): 53-64. Equilibrium adsorption property of multi-walled carbon nanotubes with OH group was studied using experimental design for the adsorption of CO2 , CH4 and H2 . The effect of temperature, pressure, their binary interactions and quadratic terms were studied for adsorption capacity of nanotubes and the results were analyzed by the face centered central composite design method and analysis of variance. The static experiments were carried out at various temperatures (288.15, 298.15 and 308.15 K) and pressures (4.50, 16.65 and 28.80 bars) in a volumetric apparatus to find out the effective parameters on adsorption capacities of each gas. In addition, influence of effective parameters was studied on CO2 /CH4 , CO2 /H2 and CH4 /H2 selectivity of nanotubes in order to realize the capability of this kind of adsorbent for separation processes. Finally, the optimal conditions to maximize CO2 /CH4 , CO2 /H2 and CH4 /H2 selectivity were determined.